Desert dwellers love a good rain, but cities long considered stormwater runoff a nuisance. Cities built massive infrastructures to drain it away quickly before it could flood streets and yards. In the Phoenix Metro Area most storm drain systems empty into washes and rivers, including the Salt and Agua Fria rivers. Now the U.S. Environmental Protection Agency is pushing for change. The agency is encouraging cities to examine how they can put some stormwater to beneficial use through what EPA calls Low Impact Development. 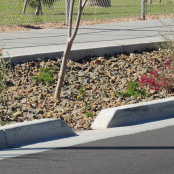 Curb cuts help direct storm runoff into landscaping. Low Impact Development is any technique that allows more rainwater to stay in place and to sink into rooftop gardens, into landscaping and planters, and through sidewalks and parking lots made of permeable pavement. It’s rain harvesting on an industrial level and can restore washes and wetlands, enhance street-scapes and parks, and help cities cool down faster during evening hours. Some cities expect the EPA to eventually stop encouraging Low Impact Development and make it mandatory. Professionals from the cities of Mesa and Glendale (with help from Logan Simpson Design and funding from the Water Infrastructure Finance Authority of Arizona) created the Low Impact Development Toolkit, which was published in April. The publication offers technical details about construction methods that make the most out of stormwater. Here are a few examples. Cuts in a street curb can direct runoff into vegetated areas. There are a variety of cuts and drains that can help rainwater enhance landscaping, restore a natural wash or create a wetlands project. Retaining rainwater also helps plants grow faster and healthier, in particular trees. Permeable paving allows rain to spread and sink into the soil beneath parking lots, sidewalks and playgrounds, keeping plants healthier and the surrounding area cooler. Permeable paving comes in a variety of looks, such as porous asphalt and concrete or paving stones. Roof top gardens catch and use the rain and direct the runoff through downspouts to catchment areas below. Cisterns above and below ground collect rainwater that can be used later to water landscaping, rooftop gardens and wetlands. Mesa and Glendale have used Low Impact Development techniques on several public projects and plan more. For example, Mesa used Low Impact Development techniques to redesign the street-scape near Fiesta Mall, along Southern Avenue at Alma School Road. Glendale used permeable paving in the Park and Ride lot at 99th and Glendale avenues. Low Impact Development serves several purposes. Stormwater is filthy, particularly in what city officials call “the first flush” of a storm. In the Valley, heavy storms pick up everything that’s been collecting for months on freeways, sidewalks, back yards, parking lots, and industrial sites. That’s why cities try to make sure that businesses store chemicals in closed containers above ground level, apartment building managers keep the lids down on their dumpsters, and dog walkers pick up after their pets. Not everyone complies. Low Impact Development would collect that first flush and filter it through sandy soil and vegetation to clean it. Hard surfaces such as roads, sidewalks, parking lots and rooftops create a “heat island” over any city. These surfaces collect heat during the day and release it in the evening, heating the air and increasing temperatures. Turning a significant portion of hard surfaces to permeable or green surfaces would help to reduce the heat island. Widespread Low Impact Development in a high-intensity development area can reduce the cost of storm drain repairs and expansions. For example, Mesa is expecting higher density development in its downtown core area once Valley Metro Rail arrives. The city wants to have a useful publication to encourage and help private developers use Low Impact Development methods. The Low Impact Development Toolkit is not just for developers. The publication also includes ideas for homeowners. Check with your city’s water conservation office for classes, videos or publications available that show you how to put rainwater to better use around your home. The Watershed Management Group also offers information and hands-on workshops.